Cast: Diane Lane, John Cusack, Dermot Mulroney, Christopher Plummer, Elizabeth Perkins, Stockard Channing. Directed by Gary David Goldberg. Story: A 40-something divorcee rejoins the dating scene. Oh goody, another romantic comedy. Before I bubble over with sheer sarcastic enthusiasm, this one's actually pretty good. The occasional man may even enjoy it (gasp). Even full-time men, come to mention it. It's a simple story, about two unconnected divorcees who find each other and get together - it's telegraphed from frame 1 so I'm not giving anything away by telling you that. In fact, the script-writers seemed so confident about showing us from the off that these two divorcees are going to get together that they forgot to tell us that they weren't divorced from each other. I spent the first 15 minutes trying to figure that out, while trying to keep up with the machine-gun dialogue. Everyone seems to deliver their sharp retorts a beat too early, just as if they'd ... well, as if they'd learned them beforehand and were merely reciting lines which, to be fair, is probably the fault of the editing rather than the actors. It's just as well that the funny lines themselves are tasty and prolific enough to counter the excessive verbal pace. Diane Lane, from Unfaithful, attempts a kind of Bridget Jones frailty, but she can't quite pull it off - she appears too together - but she's still watchable. John Cusack, from High Fidelity and Being John Malkovich, does a Chandler from Friends impression and makes a very effective funny-and-occasionally-charming suitor, with Dermot Mulroney (The Wedding Date) doing his handsome-but-shallow turn, like a B-list pre-Bond Brosnan. 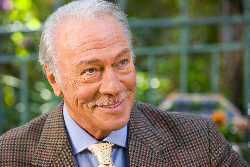 Best of all is Christopher Plummer, once again stealing all his scenes with his roguish father figure. As usual, there are the regular parade of quirky comedy sidekicks, none of which are particularly noteworthy, serving only as vehicles for some more zappy dialogue. Must Love Dogs is a cut above the norm - better than The Perfect Match anyway - and designed to appeal to the 30s and 40s crowd rather than the pre-pimple brigade. Likeable characters and a quick acetic script make up for the underlying seen-it-all-before plot and slightly over-keen editing. Probably the best romantic comedy around at the moment. I enjoyed this film: 3/5 - so nearly a 4, but just not different enough. I think the average moviegoer will enjoy it: 4/5 - unless you can't stomach formulaic rom-coms. To enjoy this film you should be: in a couple, preferably 30+. Must Love Dogs is on general release in the UK now.